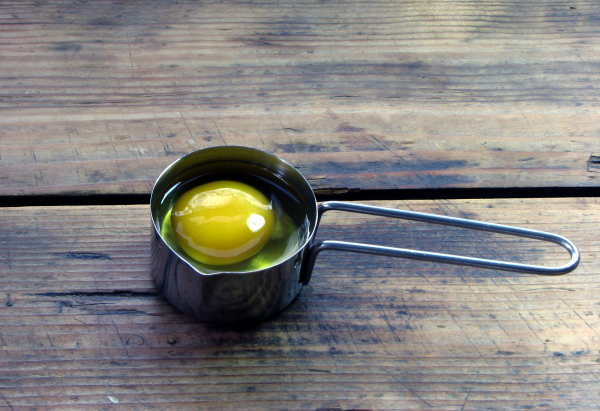 Let me begin this post by saying I have never been interested in runny egg yolks. Actually, that is sort of an understatement. More accurately, I have always been disgusted by runny, or uncooked egg yolks. 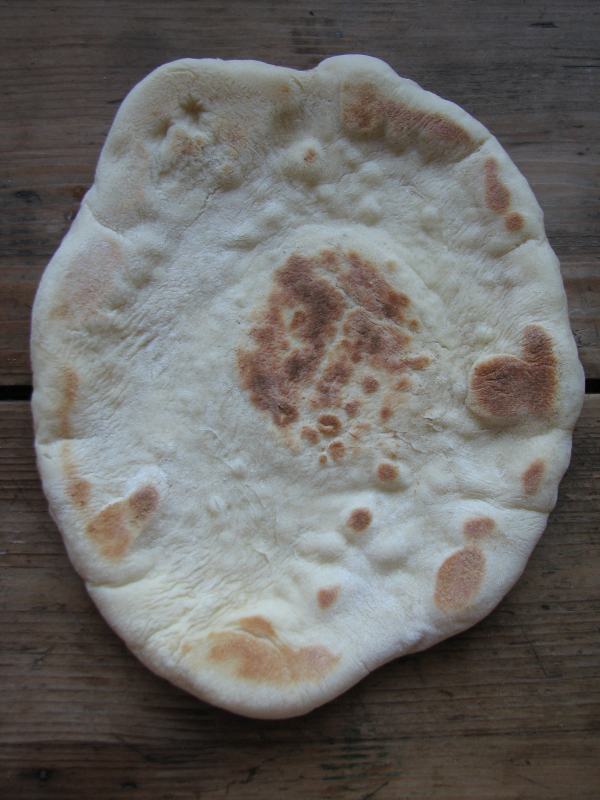 Hence, I have never had a desire to eat, drink or make anything that included them, e.g. soft boiled eggs, eggnog, raw ice cream, Caesar salad dressing, and homemade mayonnaise. I know most people love poached eggs with toast, and drenched in a perfect hollandaise sauce. It’s not that I have tried poached eggs, and not liked them, it’s that I just could never get past the runny egg. This year is not only about challenging myself to write consistently, but it is about challenging myself to think, and live outside my comfort zone a bit. This post is about poached eggs, and my new found love of runny yolks. If you have not guessed already, the theme for Week 7 of Reddit’s 52 Weeks of Cooking, is poaching. When I considered what I would be creating, I thought about tender meats (seafood and chicken), fruits (pears and apples) and eggs. I did not feel like taking a trip to the store, so I looked at the ingredients that I had in my refrigerator, and pantry. 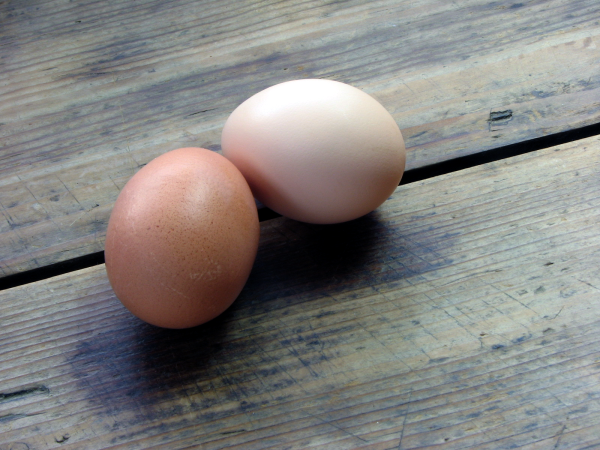 I had apples from our CSA pick up, and eggs from our chickens. My neighbor and friend just texted me the other day that she was enjoying some poached eggs, along with some of my soft cheese that I shared with her. Putting my aversion to runny yolks aside, It sounded yummy to me that day. Five days later, I decided to “man up”, and make and eat some poached eggs. 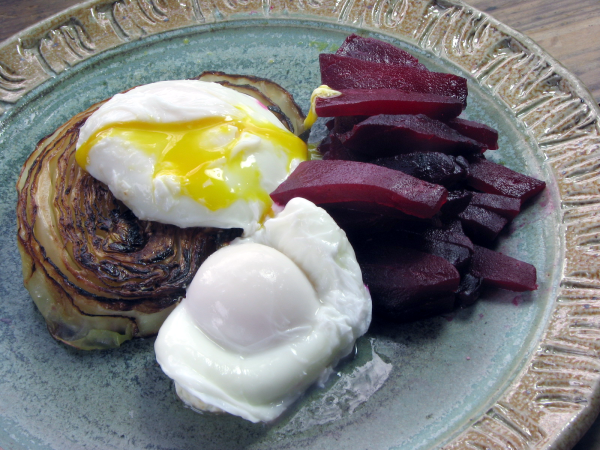 I enjoy cabbage for breakfast, and ran across a cabbage “steak” recipe, in the new Cooking Light Magazine. 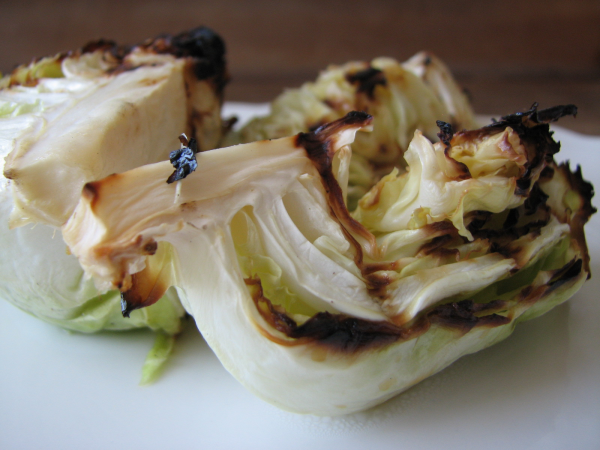 The thick slice of cabbage is grilled on both sides and then finished in the oven for twenty minutes. I decided instead, to saute my cabbage “steak” in coconut oil until caramelized on both sides. I also love beets for breakfast, and was in luck, because I roasted some the day before. 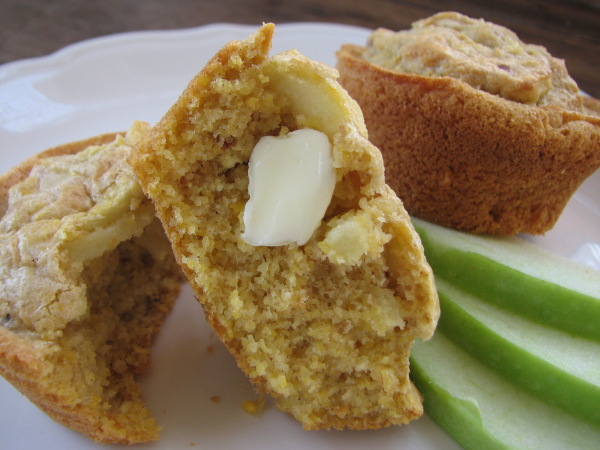 I thought they would be a delicious sweet pairing for the creamy runny egg yolk. I was right, it was sumptuous. Why didn’t I just choose a slice of toast, and make some hollandaise? For one, I am doing the Whole 30 Challenge, and toast is not a part of my life right now. Secondly, hollandaise is a super special sauce, and the post would be about getting the hollandaise just right, not about the eggs. This week’s post is definitely about poaching something. Making perfectly poached eggs was just outside of my comfort zone, and It helped me feel totally accomplished today. I went through five eggs (all delicious) before I got a halfway decent picture of my poached eggs. 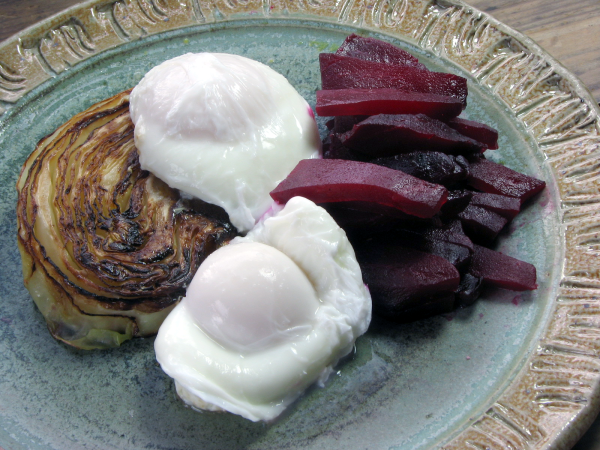 Needless to say, I had a big comforting breakfast full of delicious runny yolks that created a scrumptious creamy salty sauce to dip my cabbage and beets in. Now it is time for a nap. I hope you make these tremendously easy poached eggs at home, and sop up the yolks with whatever vessel you choose. Looks great. Can’t wait to try it!! Hi Ellie, Be sure and come back, and let me know how you liked it, ok? 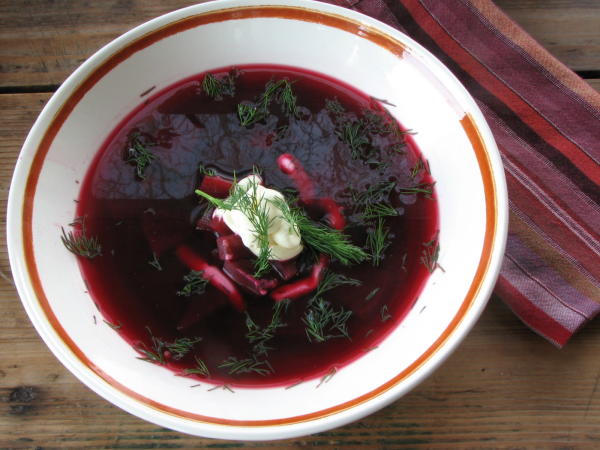 Hi Angela, It is absolutely scrumptious with the cabbage and beets! Hope you make, and enjoy it!! !